The bids will be opened in City Hall at 8:00 a.m. (MT) on Thursday, March 16, 2019. Bid award will take place Monday, May 20, 2019 at the regularly scheduled City Commission Meeting. Should bids come in above or below anticipated cost, the City reserves the right to adjust the bid specifications accordingly. 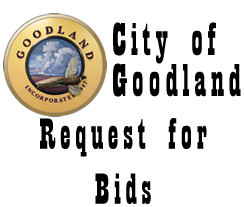 The City of Goodland reserves the right to accept or reject any or all bids for any reason deemed necessary. Payment for this project will be in lump sum after completion, compliance with all of the accepted Bid Specifications, approval of the City Manager and City Commission but not sooner than the first regular City Commission Meeting following completion. Any questions concerning this bid should be forwarded to Brian James, Building Inspector, at 785-890-4550 during regular business hours. Full bidding documents are linked below. Printed copies may be obtained at City Hall, 204 W. 11th St.